I am sure everyone in Australia and abroad has seen stunning images of kangaroos on a beautiful beach at dawn. 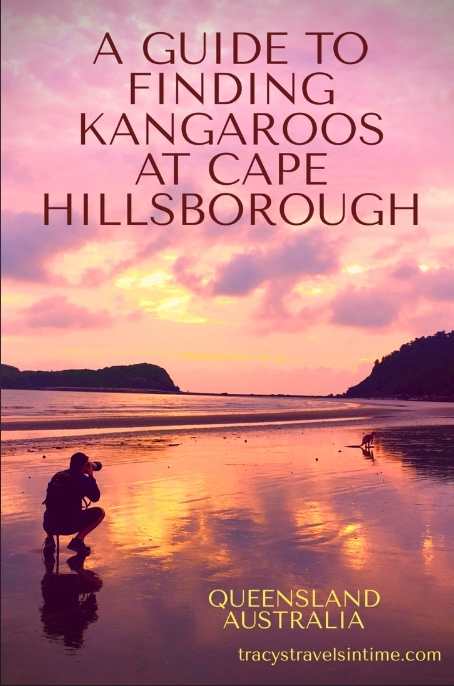 If you are a nature lover and/or a keen photographer and would like to have the opportunity to take your own photographs (or simply enjoy the experience of seeing kangaroos and wallabies in a beautiful setting) the place you need to go is Cape Hillsborough National Park in Queensland. Situated only 50 km north of Mackay, Cape Hillsborough offers visitors wonderful wildlife experiences and also the opportunity to explore forests, beaches and volcanic headlands. Cape Hillsborough was named by explorer James Cook in 1770. Before European settlement the Yuibera Aboriginal people lived in the area for thousands of years. Cape Hillsborough offers visits the opportunity to explore and experience the natural beauty of the Mackay region and is a worthwhile addition to any Queensland itinerary. 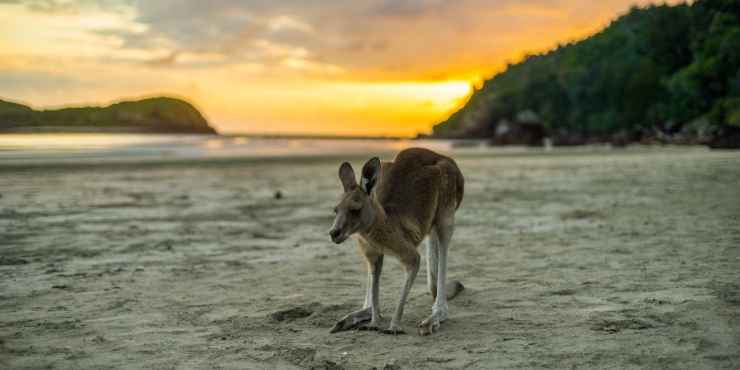 If you are planning a trip to Cape Hillsborough to see the kangaroos and wallabies my guide will help you make the most of your visit. Your questions answered. Are the Cape Hillsborough kangaroos and wallabies wild? Can I get close to the wildlife at Cape Hillsborough? What time do I need to be at the beach? What do I need to take with me to the beach? What facilities are there at Cape Hillsborough? What are the accommodation options at Cape Hillsborough? 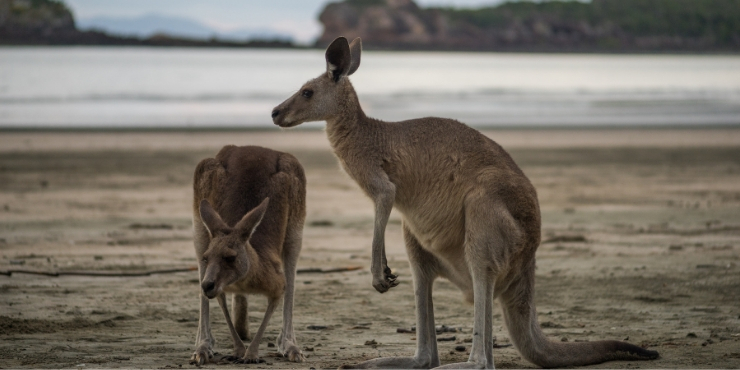 ARE THE KANGAROOS AND WALLABIES AT CAPE HILLSBOROUGH WILD? The kangaroos and wallabies come down onto the beach to feed at dawn off the seed pods that have been washed onto the shore and then hop off just after sunrise to chill out for the rest of the day. Whilst the majority of the animals are wild there there are a couple of hand-reared kangaroos who also hop down to the beach for their breakfast. CAN I GET CLOSE TO THE WILDLIFE? You can get quite close to the animals though I would be wary of going too close as these are after all WILD animals. 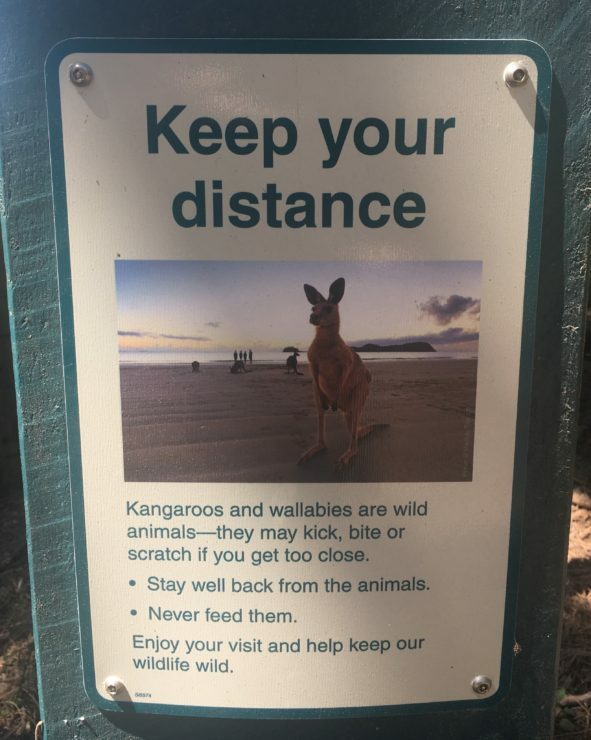 Do not stand between a kangaroo and the back of the beach. I inadvertently did this and was asked to move. It is important not to make the animals feel trapped and cut off their escape route. If the animals feel uncomfortable they need to be able to leave freely. It also should go without saying – DO NOT FEED THE ANIMALS! WHAT TIME DO I NEED TO BE AT THE BEACH TO SEE THE CAPE HILLSBOROUGH KANGAROOS? You need to be on the beach at sunrise if not a few minutes before. If you arrive too late all you will see is an empty beach with not a kangaroo in sight. If you are driving through the park to the beach be careful as kangaroos are active at dawn. It is entirely possible that they could jump across the road in front of you. Do not forget your camera or phone to take some video. If you are visiting during the cooler months wrap up warmly as it can be really chilly on the beach before the sun rises. There are a number of areas to park your car near the beach. The parking is free. There are picnic benches near the parking areas. Toilets are also available near to the beach. TIP – Why not take a picnic with you and enjoy breakfast at one of the picnic benches once the kangaroos and wallabies have left? WHAT ELSE DOES CAPE HILLSBOROUGH HAVE TO OFFER? Once the kangaroos and wallabies have left the beach you may be wondering what else there is to do at Cape Hillsborough. Visit the Diversity Boardwalk (1.2 km return/grade easy) and Yuibera plant trail (1.2 km return/grade easy) to learn about the Yuibera people who have lived in the area for thousands of years. Visit the Old Station Tea House for breakfast though note they don’t open until 9 am. Look out for other wildlife in the area. We were lucky to see a huge stag on one occasion as we drove through the park. WHAT ACCOMMODATION IS AVAILABLE AT CAPE HILLSBOROUGH? If you are staying in Mackay it is a 30 minute drive to the beach. I would recommend staying in the park if possible as it is much easier getting up early in the morning if you are a few minutes walk or drive away (especially in winter). On our most recent visit to Cape Hillsborough we managed to find an Airbnb about 5 minutes drive away from the beach. It made it so much easier to get there before sunrise and we were probably the only people on the beach for the first 10 minutes! Camping is available at Cape Hillsborough – check the links at the bottom of the page for further info. There are cabins available near the beach. For more information click the link below. Be aware that estuarine crocodiles may be in the area at all times. If you are planning to swim in the ocean you will need a stinger suit. 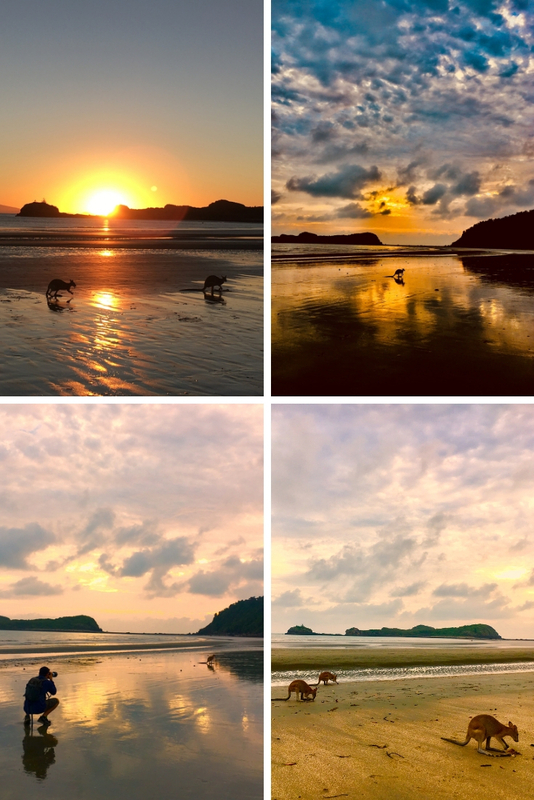 Please note that since I originally wrote this post in 2018 a “Cape Hillsborough Sunrise with the Wallabies Tour” has been introduced. In recent years there has been a dramatic increase in visitors to the beach which has resulted in the introduction of a tour. As I have not taken the tour I cannot comment. I have read that sunrise tours operate sustainably and leave a minimal environmental footprint. Hopefully I will be able to review the experience and report back soon with more information. 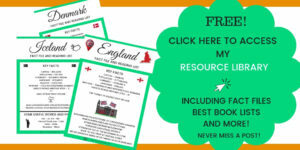 Previous Post 20 traditional English foods to tempt your taste buds! 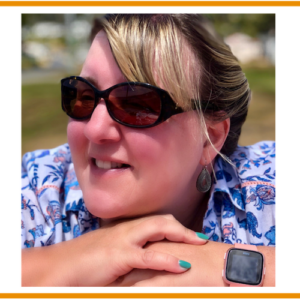 Great post Tracy, and amazing photos! Something which is on Mark’s list for a visit one day! We would love to go back so I am sure at some point we can arrange it with you! That would be fun! Thanks Louise it was fantastic! What a great place to visit wildlife in its natural surroundings 🙂 I believe those kangaroos are already used to humans, as they really gets close to them in your photos. Yes they are as its a popular place to visit – best not to get too close though! Gorgeous place to see kangaroos with the ocean in the back~ 😉 Awesome! We haven’t seen these creatures here, but we had a similar experience in Lucky Bay, next to Esperance in Le Grand NP! Kangaroos go to the beach to chill 😉 It’s very picturesque too! Thanks – it is a beautiful place to visit! AH you have no idea how much I wanna go to Australia and see those wonderful Kangaroos! They are so beautiful and cute! I am glad to find this blog post before I went, now it will help me to plan my trip! Your photos are stunning! Enjoy your trip when you come over! What an absolutely fun experience. My kids would love this. Your pictures are amazing. Cannot wait to put this on our bucket list. Thanks Lance I am sure the kids will enjoy it! Australia is so high on our bucket list! I knew kangaroos don’t like it when people get too close but I love the fact that going to the beach early will allow you some (mostly) alone time with them! Nice! Thanks for sharing this post to when the best time to see Kangaroos. Nice post with the Kangaroo, that’s so cool! So they’re not scared of people? No not at all I think they are used to them! Glad you enjoyed the post! Thanks Liana – definitely go to Cape Hillsborough when you visit Australia! This is so cool! I never knew kangaroos lived so close to the beach and even visited the beach, just brilliant! Maybe a dumb question but… what are they eating? Seaweed I guess? I am not sure I think so! I will find out! How cool to see kangaroos and wallabies in the wild! When I usually see pictures of them, it’s usually in a zoo or a sanctuary so this is so neat to see. Being an American, it’s fascinating to think about how cool “wild animals” are in other countries. Thanks Christine – definitely and I loved your post about Chobe too! 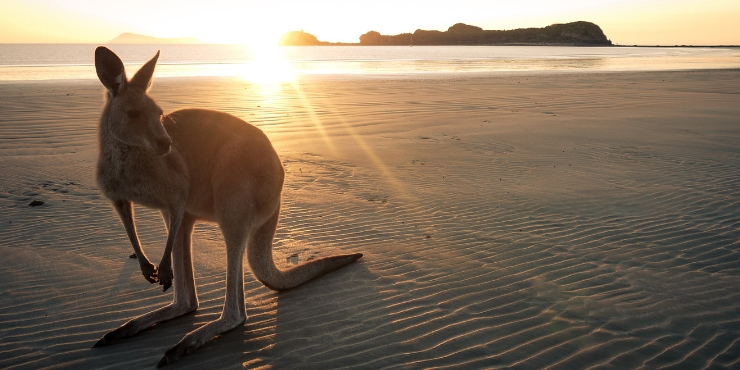 Wow these are definitely fantastic shots of the sunrise with the kangaroos on the beach! I’m not usually an early morning person, but to get these pictures, i’d be more than happy to wake up really early and watch the kangaroos. I haven’t been to Australia yet but I do plan to go there early 2019 and hopefully I’ll get to see such great sights! Thanks for the tips and recommendations. Ahh that I didnt stumbled upon your post much earlier…like in 2014! 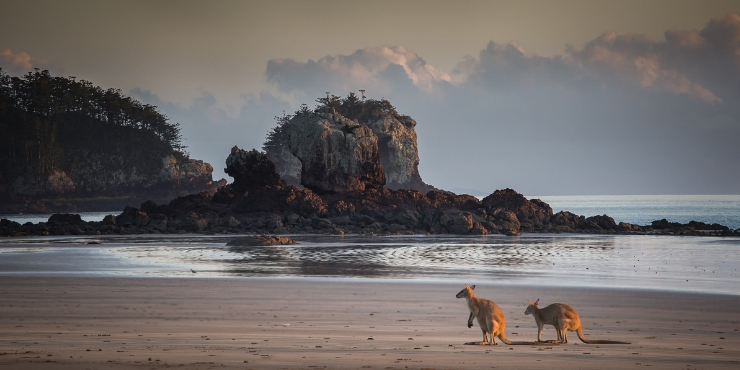 I would definitely wake up before the sun to catch a perfect shot of the kangaroos at the Cape Hillsborough! So unique experience! We are going back to Australia for sure and trust me I will get that shot! I love the pictures you have captured a lot. I am yet to see a Kangaroo can you believe. The kangaroos at Cape Hillsborough are such amazing experience to visit.I have noted the details for my future travel . Sunrise with kangaroos is a great idea. They don’t seem to mind people they are used to it so they don’t move! It is sooooo worth getting up early to see them. The video turned out great! It must be brilliant to see such cool animals in the wild, and I’m glad to hear there are decent protections around not disturbing them etc. People these days… The sunrise looks stunning, too. I am not a morning person but I think even I would make an exception for this! It is definitely worth it Rachel – such a wonderful sight to see! Kangaroos at sunset – what an amazing view! I love interacting with wildlife , real wildlife like the one you have described here. What an incredible experience. I just love seeing animals in their native habitat. I love that you remind your readers that this is the kangaroo’s beach, and we are just visitors. Thank you so much for sharing! What an amazing experience. I would love to do that, too. Thanks for sharing this great guide. I’m not going to lie – this is soooo cool to me!! Those pictures with the early morning light and water reflections are STUNNING. Just love the silhouette effect. My friend’s little brother got kicked by a wallaby so they definitely are no joke. I’d love to see these animals in their habitat though! Beautiful pictures. It reminds me of the time I spent in Australia over 10 years ago. I visited a kangaroo sanctuary in Alice Springs… and saw the most adorable baby kangaroos. Great guide! what an incredible experience! Beautiful photos – so amazing that you can get so close to the kangaroos! A nice breakfast after would be such a fun way to start your day! Great pictures! Visiting Australia and going to see kangaroos is high up there on my bucket list! Wow – I guess I don’t know a lot about kangaroos but I didn’t even know they lived around beaches? I though they were more inland animals. But… talk about an amazing photo op! 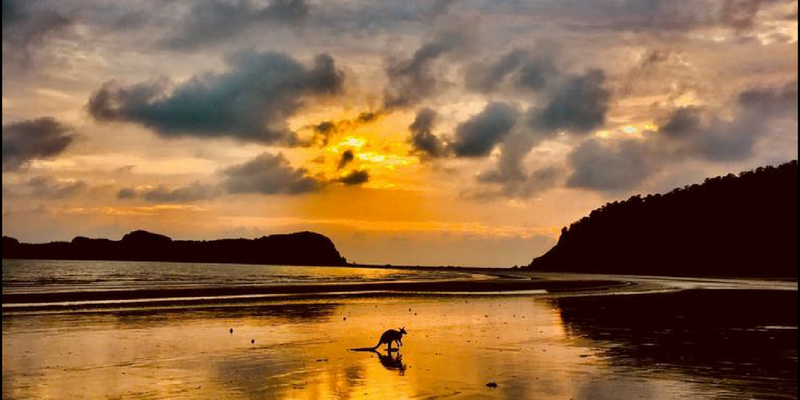 Those first photos you have of the sunrise with the lone kangaroo and her reflection on the beach is pretty incredible! OMG! We went there as well and so SOOO many kangaroos and walibees, I absolutely LOVED it. Thanks for sharing, it brings back memories. Oh wow so glad you have been! Isn’t it an amazing place! Australia has some dangerous animals, but it doesn’t matter because it has cutest too. It is fantastic seeing them on the beach! Beautiful pics and great advice. I like the thought of a breakfast picnic there, all full of excitement after seeing the roos. I hadn’t thought about leaving the escape route for them too; that’s really helpful information. I’ve only ever seen kangaroos in the wild in Adelaide, and there they were, rather unexpectedly, browsing by the side of the dual carriageway leading to the business park. Sweetest photo-shoot, I assume it is safe to say! Love the animals! the sunset is breathtaking! are they kids or grown up ones? If I ever visit Australia I’d absolutely love to do that,seeing kangas is on my bucket list but seeing kangas on a beach would be double win, I had never heard of this before. Yes even some people in Australia don’t know – glad you enjoyed it! You have provided a great guide on how to spot a kangaroo in Australia. Kangaroos are my favorite animal and they look so lovely and rare species. When I was living in Melbourne and was going towards Puffy Billy side, we saw one kangaroo just crossed the road. What a splendid sight for me but then it got hid somewhere. As you have provided all details and watching them closely, next time, I will take care of all details. Watching kangaroo on beach with a early start of day is really a beautiful start of day. I will now go early to watch these lovely species. Definitely do! Its a great sight! We are in love with our shot of the sunrise and the Kangaroo! It is so cute they just come hand at the beach too, didn’t know they would wander around there! Wouldn’t get too close of them if they are big though! Would love to visit Cape Hillsborough, it looks fantastic. These pictures are stunning!! I still can’t get over seeing Roos in the wild. How gorgeous. You had a few friendly ones. It’s such a beautiful time of day to just relax and watch them go about their business. Loved your last piece of the video. Thanks Shona! Isn’t the joey gorgeous! So cute! I love that they go to the beach too. They appreciate the beaches in Oz too I think! Glad you found them and that you like the post! It is great seeing them in the wild and on the beach is extra special! I love seeing animals in the wild! This is on my list for the next time I get back to Australia! Yes do it! It is fab! Wow! These pictures are amazing! And I can’t believe how close you guys got to the kangaroo. I would have been so nervous. This looks totally worth it to get up early for! How amazing to see wild kangaroos just doing their thing. It was lovely to see them and they seemed ok about us being around them! I think they are used to having breakfast watched by a lot of humans with cameras! I hope you can as it is a fantastic experience! How amazing! Wonderful photos too! I have been to Mackay before but never heard of Cape Hillsborough. Next time we visit I will have to get up early and head down. It is surprising how many Australians don’t know about it either and it is an amazing place! Yes I think everyone does – they seemed fine with human company! But I agree it is important to have those signs! Great post and beautiful photos! I’ve only seen kangaroos in a zoo in Australia, though we were able to get close enough to pet one. They are so much softer than I expected! To see them wild would be a dream. Maybe next time…. Love your photos! Thanks for sharing on #TheWeeklyPostcard. Thank you – they really are soft aren’t they I was surprised about that too! The kangaroo is such a neat animal. I remember one of the highlights from my trip to Australia was my coffee with the kangaroos. I thinking seeing them on a beach like this may be even better. Thanks for sharing on #TheWeeklyPostcard. Thanks Anisa glad you enjoyed it! I never get tired of seeing kangaroos in the wild. We have kangaroos and wallabies which visit us every evening. They eat the grass in our back yard. Remarkably we live in Sydney – though we are next to a national park. Even so when we travel in Australia we still seek out places to see them. I wish I had known about Cape Hillsborough last time we were in Mackay. Thanks Deeptha it was fantastic! Wow that’s so amazing – I had no idea kangaroos visited the beach! I know it is brilliant isn’t it! Thanks Anda all taken with an iphone 6s too! Yes best to keep distance and not touch them! This is so incredible. Living in the States, this just isn’t something we can ever see here. And stunning photos! Thank-you Jill – it is pretty special seeing something like this. Hope you get the chance to come to Australia so you can see them for yourself – magical experience! 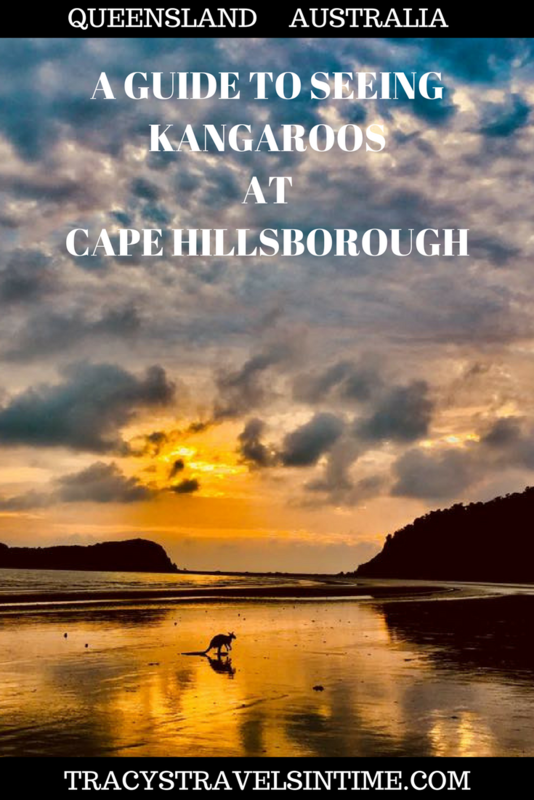 This post is encouraged me to visit cape Hillsborough for watching kangaroos. Thank you, Tracy, for this post. Awesome! Too bad, I didn’t come across articles like this before going to Australia. I was so eager to see them every day, all day, haha. Anyway manage to saw then a couple of times, not at the sunrise but mostly just before the sunset. This is fantastic! We SO want to do this – and we will take your advice to stay nearby. Another great To Do for our ever-growing Australian Bucket List. Great photos, btw. Thanks for sharing on #TheWeeklyPostcard and #WeekendWanderlust! 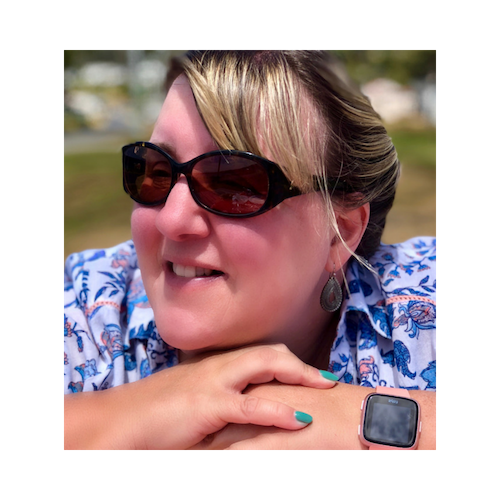 Thanks – yes definitely get up to Mackay and explore that region with kangaroos on a beach and platypus at Broken River its a great place to explore! Nice one Tracy – I don’t think I will ever get bored of seeing Kangaroos. I’m living in Tassie at the moment and you tend to see more wallabies here. OoooH we can’t wait to visit Tassie! Lots of pademelons we hear! I love how close you guys were able to get to them and we had similar experiences in the outback. I love kangaroos and getting so close to them (especially on a beach) would be incredible! It was a great experience! I also love roos!